A week after Hurricane Harvey pummeled the Texas coast as a Category 4 storm, some residents of the region are finally beginning their journey toward recovery. Others, left without drinking water, forced from their homes, or trapped in cities transformed into islands, are still stuck in the middle of a crisis. Local officials have recorded at least 46 deaths related to the storm as of this morning, and warned that the number could rise as recovery efforts continue. The core of the storm, which is beginning to lose some of its tropical characteristics, is traveling north up the Ohio River Valley and Mid-South, according to the National Weather Service. The storm isn't expected to dissipate until later Saturday. 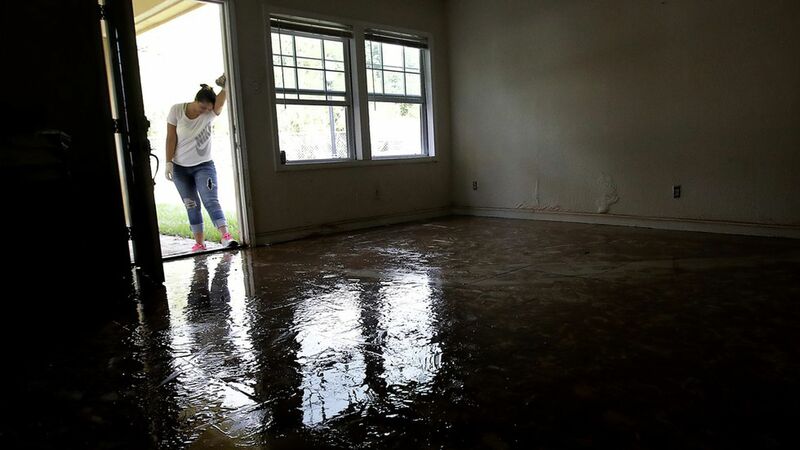 In Beaumont, a city of roughly 118,000 near the Louisiana border, running water has been cut off completely, and many people are stuck with no escape as the rainwater has turned it into an island. Much of Port Arthur, a city of about 55,000 roughly 100 miles east of Houston, still remains underwater, with flooding covering the highways and cutting it off from the rest of the state. Officials are keeping a close eye on the chemical plant where two blasts took place on Thursday. The company warned that more could follow and said "The best course of action is to let the fire burn itself out." Another hurricane, Irma, is building over the Atlantic. Forecasters say it is still too early to know whether it will reach the U.S.
President Trump and the first lady will travel to Texas and Louisiana Saturday, and will likely visit the Houston area and Lake Charles. Trump is pledging $1 million of his "personal money" to Hurricane Harvey relief, and has also requested Congress free up $6 billion for immediate Harvey recovery. Electricity provider Entergy said about 61,000 customers are without power in eastern Texas. About 9,500 customers in western Louisiana were also without electricity, per NYT.